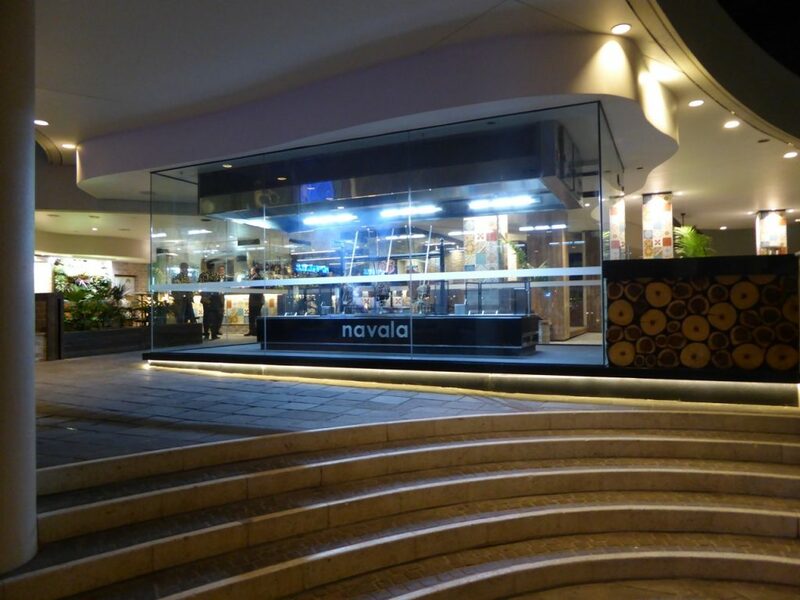 Navala is a Brisbane Restaurant located on the Brisbane River on Eagle St Pier. Originating in the mountains of Southern Brazil, ‘Gaucho’ (Cowboys) would set ablaze great trenches of wood & charcoal & surround them with giant cuts of meat skewered to the ground. 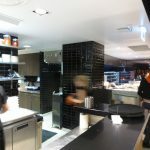 They strive to bring this unique & truly authentic experience in a modern, vibrant setting. 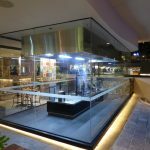 When Navala Churrascaria was in design phase there was a vision to create a glass encased solid fuel Brazilian BBQ cooking station at the front of the restaurant. 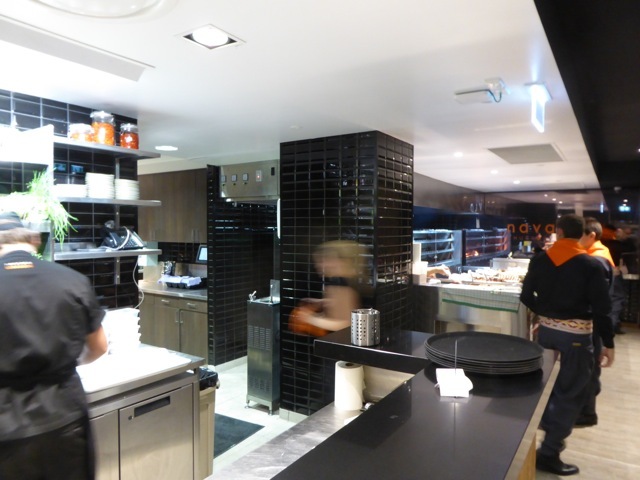 This design was going to be the focal piece of the restaurant offering a show for restaurant goers and passersby alike. From an exhaust point of view it was a complete nightmare! First challenge – Solid fuel cooking. 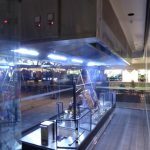 Solid fuel cooking creates a high level of particles including embers that need to be filtered right from the get go in order to reduce the risk of fire. 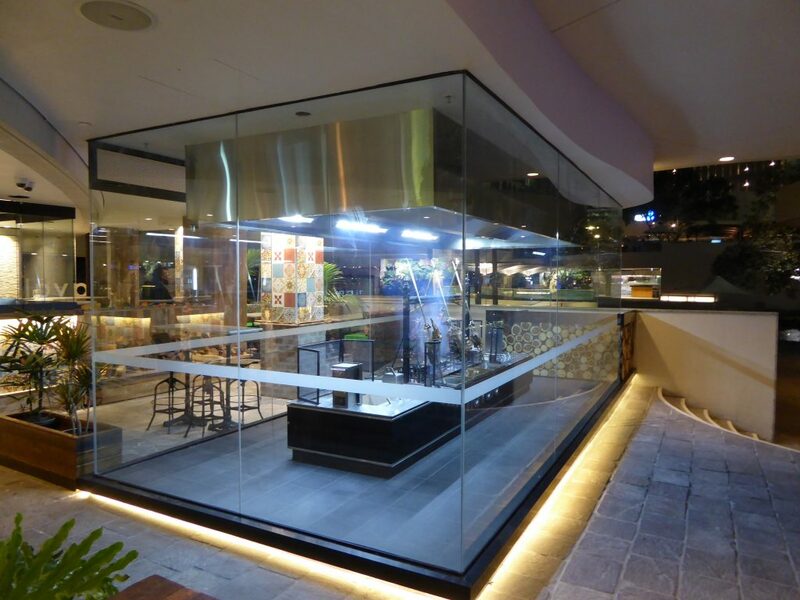 Second challenge – Glass encased cooking line. 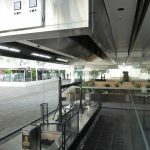 Not only did the filtration have to remove a large amount of particles it also needed to remove all the smoke from the solid fuel burn quickly so that firstly the chefs cooking on the line could cook without inhaling smoke and secondly so that the room was clear of smoke so that the customers could see the magic. Third challenge – Regular servicing required. Due to the solid fuel used, the frequency of cleaning required was going to be very high. The filtration system needed to be easily serviceable. Fourth challenge – Looks. 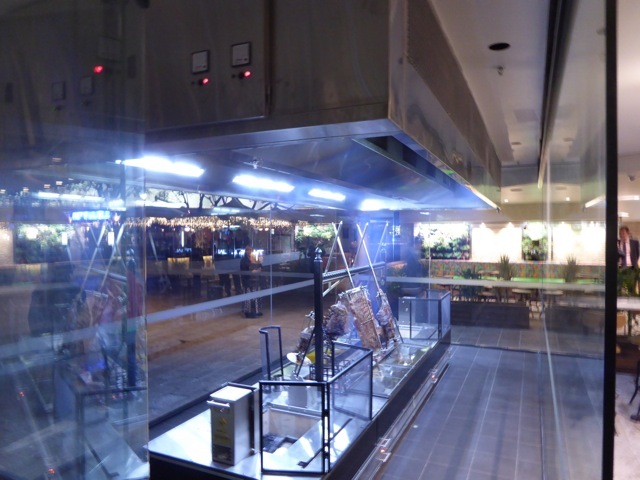 The exhaust system needed to be good looking as it was on display at the front of the restaurant for all to see. 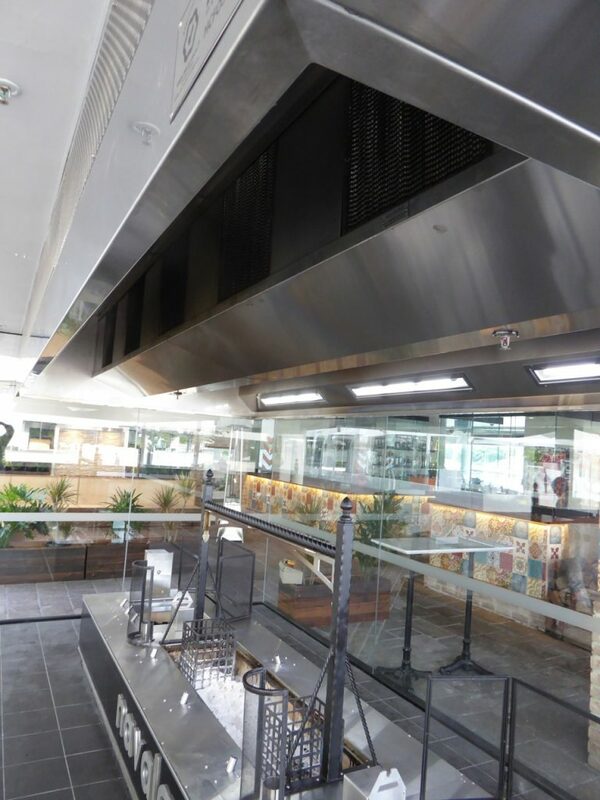 AOM Australia’s signature HCFO exhaust hood was the natural choice for this project. 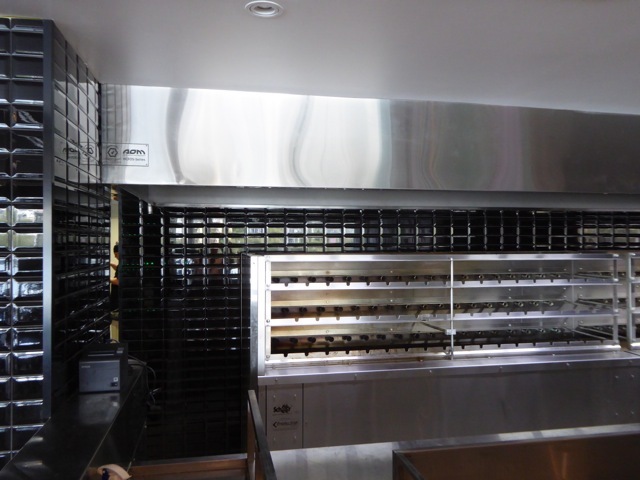 HCFO hoods are custom designed and contain all the filtration and odour mitigation systems in the hood. This means the particles, smoke and odour are caught and stopped at the hood and go no further. Easily serviceable as the electrostatic precipitator cells sit just behind the honey comb filters. 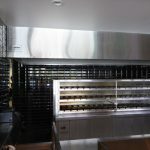 It is only a matter of opening a panel and sliding the cells out to be replaced with clean ones. 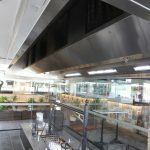 Due to its custom build AOM Australia was able to design a hood that had clean lines in stainless steel as required by the aesthetic design of the restaurant. 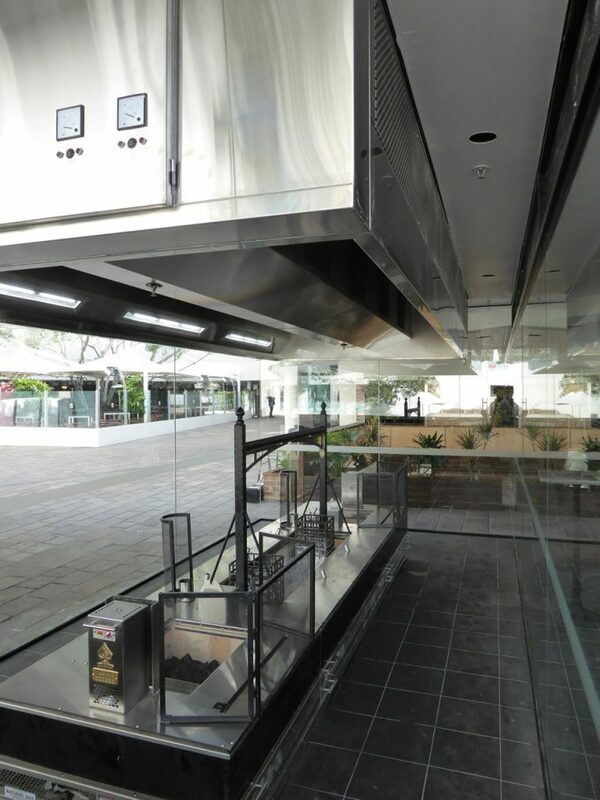 Result – A Brazilian BBQ glass encased cooking line that looks great and is free of smoke and odour.